In the Water unit students are introduced to the structure and function of water, as the medium of life. Water has many useful properties, and so it is ubiquitous in life on earth. The useful properties of water arise from its structure. ​Water is the medium of life. 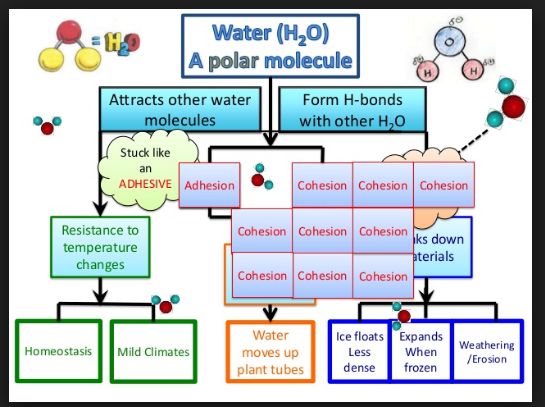 Describe where and how water is able to form hydrogen bonds. Water molecule formed by hydrogen bonds between oxygen and hydrogen. However sharing of electrons is unequal and are attracted to the oxygen more. Partial negative charge develops on the oxygen and partial positive on the hydrogen. Attraction between water molecules forms a hydrogen bond and forms when a hydrogen atom in one polar molecule is attracted to the slightly negative oxygen atom in the other molecule. A water molecule consists of an oxygen atom covalently bound to two hydrogen atoms. Since O is more electronegative than H, an unequal sharing of electrons occurs. 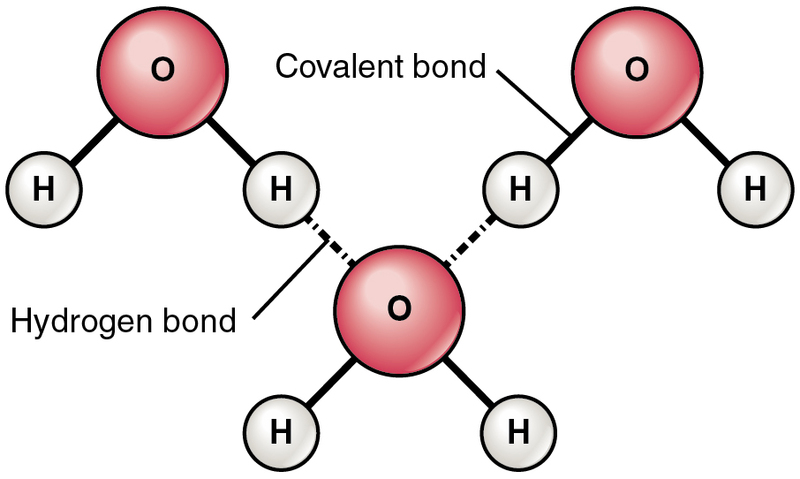 This creates a polar covalent bond with H having a partial positive charge and O having a partial negative charge. List the types of molecules that water will dissolve. Compare and contrast the physical properties of methane and water. ​Water can evaporate at temperatures below the boiling point. Hydrogen bonds need to break for this to occur. 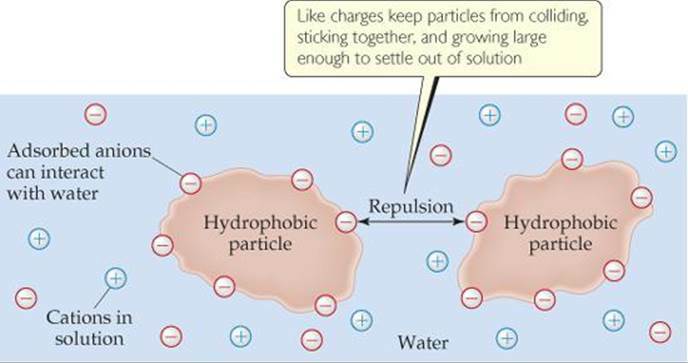 The evaporation of water cools body surfaces by using the energy from liquid water to break the hydrogen bonds. Sweat uses evaporative cooling to maintain body temperature. As liquids evaporate, they shed molecules into the air. The liquid changes into a gas, drawing heat from the liquid. The process draws heat from the body. Evaporation also cools the remaining liquid because faster-moving hot molecules are more likely to escape into the air. ​Outline the mechanism of transport in the blood of the following molecules: glucose, amino acids, cholesterol, fats, oxygen, and sodium chloride. ​The solvent properties of water mean that many different substances can dissolve in it because of its polarity. This allows substances to be carried in the blood and sap of plants as they dissolve in water. It also makes water a good medium for metabolic reactions. Oxygen: Non polar but small enough to dissolve in water in very small amounts that is not enough to satisfy aerobic respiration. Haemoglobin present as binding sites for oxygen. Fats molecules: Entirely non polar and travel inside lipoprotein complexes which have a single layer of phospholipid also containing proteins. There are challenges for the increasing human population in sharing water resources equitably for drinking and irrigation, electricity generation and a range of industrial and domestic processes. Claims about the “memory of water” have been categorized as pseudoscientific. What are the criteria that can be used to distinguish scientific claims from pseudoscientific claims? ​Hank teaches us why water is one of the most fascinating and important substances in the universe. ​Explore some properties of water with the Amoeba Sisters! It's all about those hydrogen bonds. Terms discussed include adhesion, cohesion, surface tension, specific heat - all made possible by those amazing hydrogen bonds. Water is both essential and unique. Many of its particular qualities stem from the fact that it consists of two hydrogen atoms and one oxygen, therefore creating an unequal sharing of electrons. From fish in frozen lakes to ice floating on water, Christina Kleinberg describes the effects of polarity. ​In this video Paul Andersen explains how the polarity of water makes life on the planet possible. Oxygen is highly electronegative and pulls the electrons closely creating a partial negative charge. The polarity of water (and the corresponding hydrogen bonds) create cohesion, adhesion, capillary action, high specific heat, and a universally good solvent. The diving bell spider uses surface tension and a little bit of web-egineering to build a bubble to allow it to live and exchange gases underwater.